Anyone who has ever forgotten the cable to connect their Blackberry smartphone to multiple PC’s (and really needed that document they can see but not print), will appreciate the genius behind Tazzle IT. This is a USB innovation that makes the sharing of files between certain Blackberry smartphone models and PCs easier than ever! Basically, with the Tazzle IT USB tool a person can send files directly from their Blackberry smartphone to any computer or printer within thirty feet of the device. These files include message content, attachments and photos. Simply plug Tazzle IT into the computer’s USB port. The Tazzle Desktop Software must be on the PC you’re using, but it operates as an easy-to-follow download. No network access, cables or subscriptions are needed to use the Tazzle Blackberry tool. The mess of configuring mobile devices to different PCs, WiFi networks and corporate firewalls is eliminated. And, that is a huge relief for people who need to get from one place to another with as little baggage as possible, as quickly as possible. Basically, a Tazzle server is set up for this file transferring. One of the reasons that the Tazzle Blackberry tool is so unique is that when a person chooses to view, print or send files between their phone and any computer, they are not leaving behind any information on that system at all. All of the data that is on their Blackberry stays securely on their Blackberry! 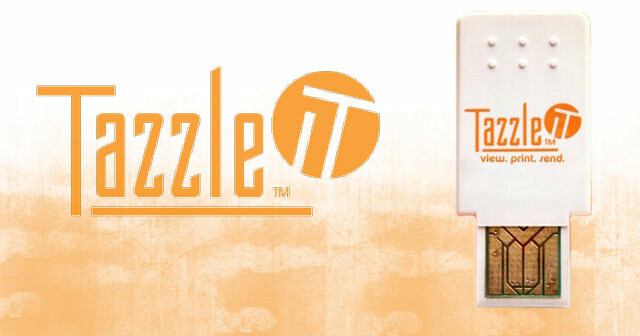 Tazzle USB keys are the kind of device that may make a person wonder how they ever functioned without one! It is easy to use, and incredibly flexible for users who are on the go. Tazzle IT performs optimally with the Blackberry Bold, Blackberry Curve 8900 and Blackberry Tour. By and large, most folks will find the $79.95 price tag quite reasonable for the convenience that this unique USB Key brings. It is supported by Windows XP, Windows Vista and Windows 7 operating systems. Do you frequently use file sharing between your smartphone and PC? Do you think the Tazzle IT USB key would enhance that experience? Tell us why or why not. This entry was posted in BlackBerry, Flash Drive, Tazzle IT, USB Devices, USB File Sharing, USB Gadgets, USB Technology and tagged Blackberry, BlackBerry App World, Blackberry Tazzle USB key, Blackberry USB Key, Tazzle Blackberry tool, Tazzle IT, Tazzle IT BlackBerry App, Tazzle IT USB Key, Tazzle IT USB tool, Tazzle USB Bluetooth key, USB innovation. Bookmark the permalink. Thank you for the nice write-up! Be sure to check-out the new presentation control features that turn your BlackBerry into a remote control for PowerPoints and don’t miss the 40% OFF promo on http://www.tazzleit.com!